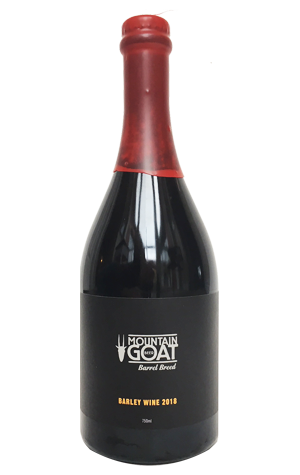 It was the first Barrel Breed Barley Wine that kicked off Mountain Goat's rampant run at the Australian International Beer Awards, with that Champion Australian Beer trophy in 2015 followed by two Best IPA trophies, one for Best Pale Ale and, in May 2018, Champion Large Australian Brewery. It's been followed by some other top notch Barrel Breed releases too, with a couple of the Imperial Stouts and a delicate strong Belgian golden ale released at Christmas 2016 among the highlights. With subsequent Barley Wines not hitting the same heights, for number four the brewers decided to start again from scratch, designing a beer built, for the most part, upon malts from their mates at Gladfield Malt in NZ. They turned out a beer so dense they had to employ a yeast strain actually called "Super Yeast" to ferment it to where they wanted it. Then, once that was achieved, the beer spent a couple of months in casks that had previous housed Tennessee whiskey. So, what did they end up with? Well, despite taking a different route, the end point is in roughly the same ballpark, a chestnut coloured beer with a light tan head that's awash with dried fruits, sweet spices, toffee, brown sugar, a touch of vanilla and flashes of the casks' former inhabitant. You could liken it to a fortified after dinner wine – a Tokay or a sherry, perhaps – which is probably the best time to crack yours open, armed with a chunk of blue cheese as accompaniment. Or, if you're able to resist, it's a beer that's likely to gain more dimensions if cellared carefully.